then marries her, becomes a multi-multi millionaire, is indicted for heavy handed business practices, turns into a beer baron, parties with 10,000 orphans at Coney Island, sees his 32-room home burn to the ground, moves to a mountaintop mansion in Ridgefield, and soon dies. Oh, and his widow marries a supermarket magnate and lives on Fifth Avenue. It was the era of the icebox, long before the days of refrigerators, and Rubel sold blocks of icebox ice to the occupants of the tenements in the East New York section of Brooklyn. The business grew, expanded to include coal for heating, and within a few years, he and his brother headed the Rubel Coal and Ice Company in the Brownsville section of Brooklyn. In 1912, The Times published the first of dozens of stories about Rubel — this one probably the most extraordinary. In February, he pressed charges of forgery and grand larceny against Dora Nachumowitz, who had been his bookkeeper. She had also been his fiancé. Nachumowitz was released on $1,000 bond but apparently the charges were soon dropped, for not long afterward, Rubel and Nachumowitz were married. They went on to have two daughters, and remained together until his death. She, in fact, took over his corporation when he died. 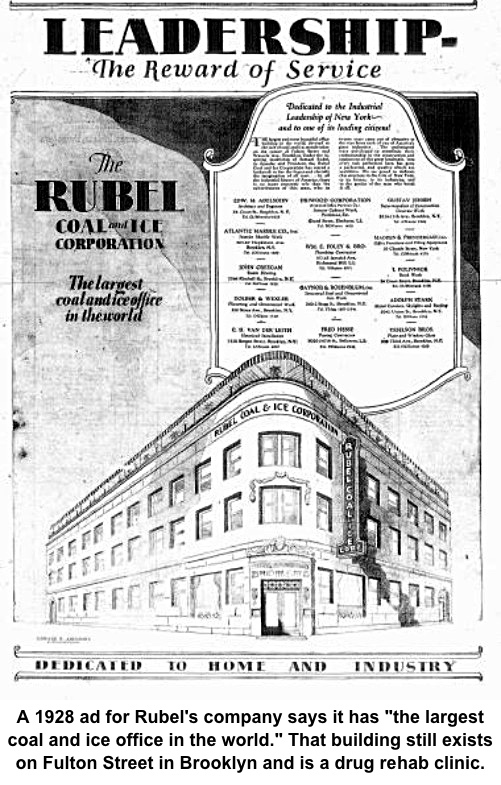 The Rubel ice and coal empire, with Samuel now in command, continued to grow. By 1913 his company was worth $2 million and in 1925, 20 years after he’d arrived from Latvia, he’d engineered a $25-million merger with several companies into the huge Rubel Coal and Ice Corporation, which became the largest purveyor of those commodities in the eastern United States. (His newspaper ads in the late 1920s proclaimed that he had “the largest coal and ice office in the world.”) He had 25 ice plants and 15 coal supply yards spread around New York City alone, and was also serving customers in northern New Jersey. Two years later he acquired even more companies, had 40 ice factories, 50 coal yards, 2,000 employees, and a value of nearly $30 million. Rubel would promote his coal with a bit of humor: “One good ton deserves another,” he’d quip. But legal problems were beginning to arise. In 1927, a court in Brooklyn indicted Rubel and two of his officers for conspiracy to drive competitors out of business. They were also served with 28 separated civil actions. “Among the intimidations charged to the defendants is a demand that stockholders in the Paerdegat corporation turn over their minority stock of the Rubel corporation to them on pain of being driven out of business,” The Times said. “When this demand was refused, according to the indictment, the Rubel corporation not only refused to sell ice to those stockholders, but prevented them from getting it elsewhere. Free ice was furnished to customers of the Paerdegat corporation to take them away from that corporation.” The cases were eventually settled quietly. Later that year, one of Rubel’s own partners named Henry J. Senger sued him for $6 million, charging that Rubel had lied to him about the degree of authority Senger would have in the company — Senger said he understood he would be an equal partner when he merged his company with Rubel’s — and that Rubel even had detectives spying on him. The two settled that suit out of court a year later. 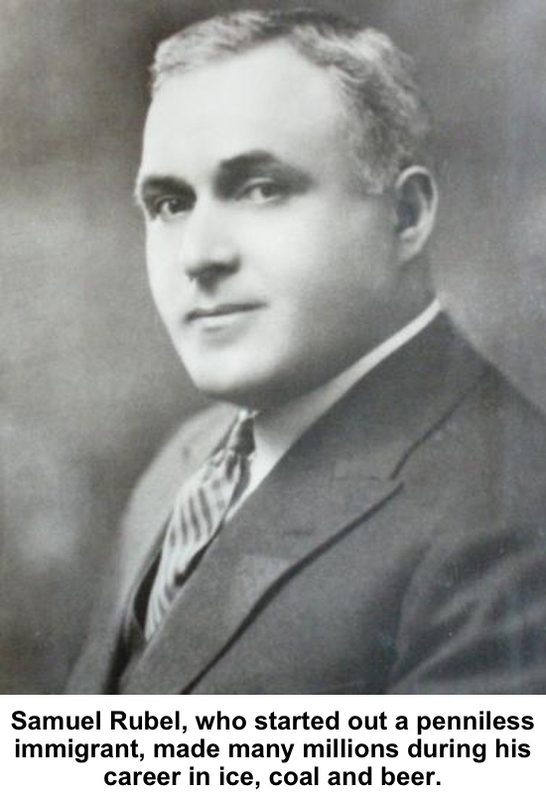 In 1930, Rubel filed a libel suit against Jay Carton, an investment broker and one of his minority stockholders, charging that Carton had written a letter to other Rubel minority stockholders in which alleged that Rubel had failed to pay them dividends and forced them to sell their stock at less than book value. Two years later, Carton himself sued, charging Rubel with mismanaging the company and speculating on Wall Street with its funds, causing the company to lose $20 million. The Rubel company by then was said to be worth $40 million — $715 million in 2016 dollars — of which more than 90% was owned by Samuel Rubel himself. That December, after a two-week trial, the suit was suddenly and unexpectedly settled out of court. Finally, in 1934, a New York Supreme Court judge sentenced Rubel to 10 days in jail for contempt of court after he had shown a “flagrant disregard of court mandates.” The judge had ordered him to appear in court in connection with another civil suit by a company called Paramount Ice, which had charged Rubel with using illegal tactics to take over their territory and thereby create a monopoly in Brooklyn. Rubel failed to appear and was sentenced to jail. He appealed and escaped the sentence, but paid a fine. Meanwhile, if all those legal battles were not enough, in 1931, two 20-year-old men sent a letter to Rubel’s wife, Dora, threatening to kill her if she did not pay them $10,000. The two were arrested, convicted of attempted extortion and sent to prison. more common and his ice sales were declining. 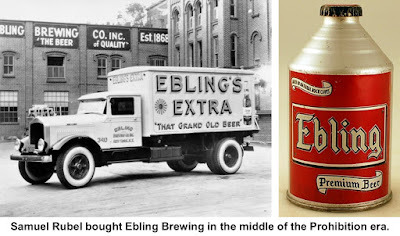 So in what some might consider an odd move during Prohibition, he bought the Ebling Brewery Company in the Bronx, noted for making beers “aged in natural rock caves.” Perhaps he saw the repeal of Prohibition as inevitable. Probably he got a great price in the dry decade, especially after a scandal in which Ebling’s headquarters were padlocked by police after a raid uncovered two truckloads of beer with higher-than-legal alcohol content, The Times reported. At any rate, while Rubel told authorities that he planned to use the factory for making ice cream, he probably instead produced legal “near beer,” which had a very low alcohol content, to keep the operation alive until until Prohibition was repealed in 1933. The brewery became a big money-maker in the 30s and at least the early 40s. In 1947, Rubel was widely quoted when he decided to take part in voluntary grain rationing to help provide more food for Europe, which was still struggling in the aftermath of World War II. “When it’s a question of beer or bread, our vote is for bread every time,” he told the President’s Food Committee in Washington. 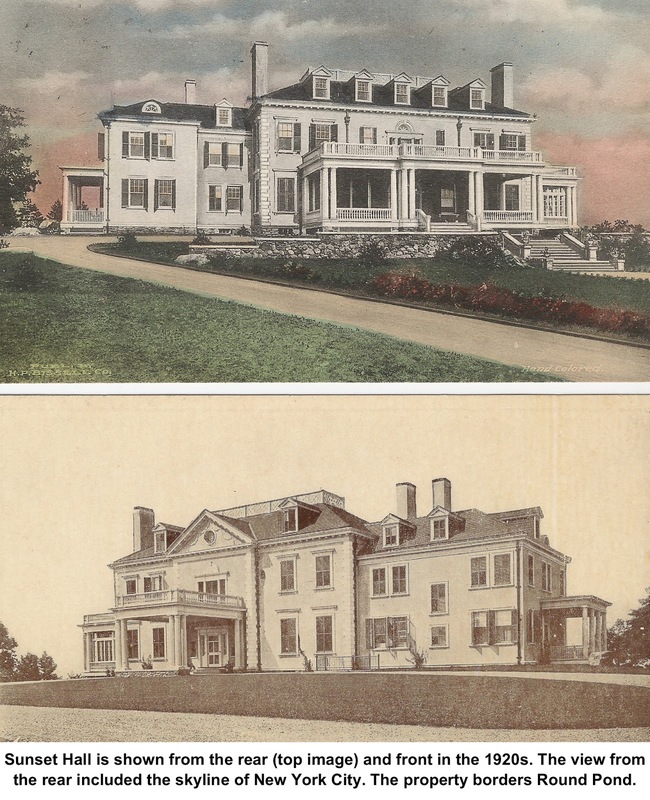 In 1947, Sunny Cutten was trying to sell her house, Sunset Hall, a mansion built in 1912 on Old West Mountain Road in Ridgefield. She even offered it to the United Nations as a possible headquarters site, and they came and took a look. The handsome house included eight bedrooms, six baths, nine fireplaces, a full-sized ballroom, views if the New York City skyline, and many other amenities. Samuel Rubel may have been hard-nosed in business, but he was soft-hearted when it came to kids. He supported the work of many orphanages in the city and in 1933, brought more than 10,000 orphans at his own expense to Coney Island for a day of fun to mark the 65th anniversary of the Ebling Brewery. A few months before he died, he donated 1,100 acres — including the 350-acre Lake Stillwater — in the Poconos to the Boy Scouts of America. The land, now known as Camp Minsi, is still in use today (an inlet on Lake Stillwater has been named “Rubel Cove.”) A longtime member of the Brooklyn Boy Scout Council, Rubel said the gift expressed his gratitude for the opportunities that America had given him. On April 27, 1949, Rubel suffered a blood clot while at his New York office. Two days later, he died at Sunset Hall. He was 66 years old. contents of Sunset Hall were sold at a 1950 auction at Parke-Bernet Galleries — now Sotheby’s. The catalogue for the sale was 142 pages long. The estate itself was purchased in 1955 by the Congregation of the Mission of St. Vincent de Paul. 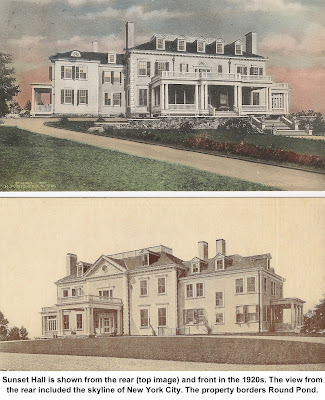 It was used as a novitiate to train future Vincentian priests and brothers until the late 1960s when it reverted to a single-family residence. 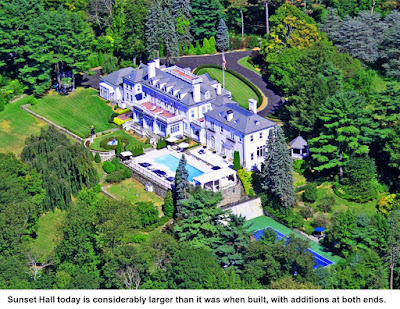 For many years, it was the home of actor Robert Vaughn. In 1959, Dora Rubel, then chairman of the board of the Rubel Corporation, married a recent widower, Louis Daitch, one of the owners of the Daitch Supermarket chain which became known as Shopwell and now, The Food Emporium. She died in 1969 at the age of 74 and is buried next to Samuel in Mount Ararat Cemetery, East Farmingdale, Long Island. Rubel’s colorful and litigious life included a history-making event with which he had no personal connection, yet bears his name. On Aug. 21, 1934, an armored car, collecting money for deposit in a bank, had stopped at one of Rubel’s ice and coal depots in Brooklyn to pick up a $450 deposit. A gang of hold-up men overpowered the guards and stole $427,000 — nearly $8 million in today’s dollars — from the truck. 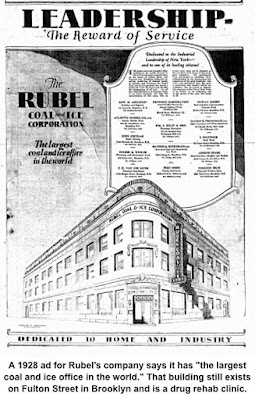 “The Rubel Ice and Coal Corporation Robbery” was famous for decades as holding the record for the largest amount of money ever taken in a robbery in New York City history.